Every Tuesday I post a photo of a texture or the use of a texture and share a detail of my part of the world. I invite you to join in the fun of sharing an image of the textures around you by including a link to this post in your own (you don’t have to make an exclusive Tuesdays of Texture post; why not mix and merge challenges!). My land is bare of chattering folk; the clouds are low along the ridges and sweet’s the air with curly smoke from all my burning bridges. 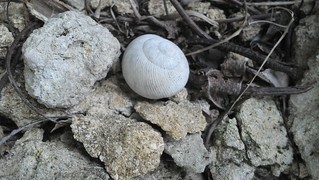 The ridges of this little shell stopped me the other day. Daily walks have transformed into more of weekly walks as the weather gets colder and windier and when something cute like this appears I take it as a positive nod. Have a happy and textured Tuesday! Remember to share a bit of your part of the world. I always enjoyed finding shells when we would travel to ocean-side locations. This one looks so perfect! I’m also fond of rocky coastlines. As for your comment on my post, please don’t adjust the posting time (unless you want to for your convenience). I tend to be a night owl and it’s easier for me to post a day early and link up later. As well, I don’t always post every week.